Do you wish your children were independent learners or at least able to work on a few subjects independently? I used to tell people that one of my goals in homeschooling my children was to create independent learners who had a strong sense of personal responsibility. I’m now learning that this goal is a lofty one. And it might not be feasible for an elementary-aged child. Can elementary-aged kids complete work independently? I spend several minutes explaining the instructions to Curly before handing her the worksheet. She tries to get started and then is too confused to continue. I explain the page again. She starts again and within minutes she’s complaining that it is too hard. I try to encourage her and give her a little pep talk about how I know she can do the page. She sits quietly with her paper while I work with another child. I glance back over to find her daydreaming out the window. I remind her about her paper. I glance back several minutes later and find her drawing on her page. She tells me she has forgotten how to do the page and doesn’t understand the instructions. At that point I’ve wasted 30 minutes. During that time I’ve attempted to work with another child while still supervising Curly. In that interrupted school time I’m a terrible teacher to the other child as I feel scattered and frustrated. That’s when I realize that it would be faster and easier to just sit nearby and provide support and encouragement as Curly works. I can answer her questions immediately and I can grade her assignment as she completes it. With the instant feedback, she can correct her mistakes and learn from them. 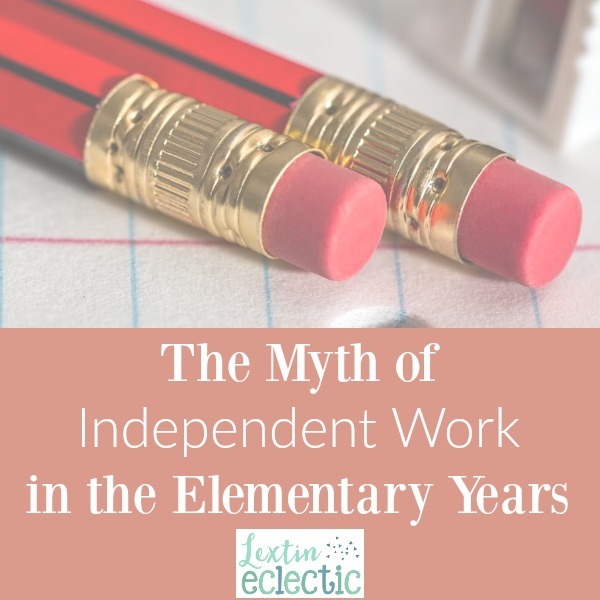 So, why is independent work in elementary a myth? Little people can’t focus for very long – They spend more time daydreaming or watching what everyone else is doing than working on their assignment. They need lots of redirection – You might spend more time reminding them to complete their work than they would actually need to finish the page with your help. It takes longer to grade the work later – When they work on their own and do their assignment (sometimes very sloppily), it takes more time to correct their mistakes and then go back through the corrections with them than it would have taken to correct them as they work. Kids at this age need lots of assurance and encouragement as they work. They are still just beginning to learn to read, spell, write, and do basic math. I’m finding it best to sit nearby to support those early learning efforts rather than waste time in frustration on both their part (with being confused) and on mine (with having to stop what I’m doing to help them). My kids clearly need some mom-time and interaction to learn and complete their work. So, is it impossible for a child in elementary to work on an assignment independently? No. Some kids have the ability to work on their own from a young age. There are some kids who actually work better when left alone. However, I’ve found that for my kids, I spend more time redirecting, explaining, and correcting assignments when I’ve asked them to work on their own. It just hasn’t been worth it for me at these ages. Clearly, working independently is a learned skill and one that takes time to develop. We’re just not quite there yet at our house; however, we are still aiming toward independence as a final goal in our homeschool. Please tell me that by highschool my kids will be able to finish a page without me leaning over their shoulder! Ok, I'm not alone. I SO needed to read this. Thank you! Welcome! I often need to read it myself. Homeschooling takes lots of work and my kids need me to be involved and engaged. It's so challenging sometimes but it's so worth it! This is so, so true! I actually sit down with my kids one on one for reading/phonics and math for my kids up to around age 7 or 8, and just math for the rest of my kids. It’s so nice when you don’t have unrealistic expectations that frustrate you and upset your child. Great post! Yes. I know I had unrealistic expectations going into homeschooling. I’m so thankful that I quickly learned to sit with my kids and guide them through their schoolwork. Now as they are getting older, they are able to work more independently and are very responsible because I’ve helped them learn how to learn on their own. Yes, they usually require a little direction at the younger ages – and even the older ones need additional help and redirection.